The Otis-Lennon School Ability Test (OLSAT) is a multiple-choice K-12 assessment that measures reasoning skills with several different types of verbal, non-verbal, figural and quantitative reasoning questions. Schools commonly administer the OLSAT for admissions into gifted and talented programs. What is on the OLSAT Test? The OLSAT consists of 2 main verbal and nonverbal sections. The verbal sections contains verbal comprehension and verbal reasoning questions while the nonverbal section contains different types of pictorial reasoning, figural reasoning and quantitative reasoning questions. The verbal and nonverbal sections can also be administered in standalone fashion depending on what the school or district is looking for. For example, the New York City gifted program administers the verbal section of the OLSAT while relying on the NNAT for their nonverbal scores. For examples of the 21 different types of verbal and nonverbal questions that students will be expected to answer while taking the OLSAT, start practicing now with our 100 free practice questions below. Creators Arthur Otis, Ph. D. and Roger Lennon, Ph. D.
Which level of the OLSAT will my child take? Depending on the student’s grade placement, they will be assigned to a specific OLSAT test level. Kindergarten students are tested with Level A, first graders are tested with Level B, second graders are tested with Level C, third graders get Level D, fourth and fifth graders get level E, sixth to eighth grade take level F, and students from ninth through twelfth grade get Level G.
Levels A, B, and C are read aloud to students. The level A test, the OLSAT test’s lowest level, is designed to assess school abilities of kindergartners. More specifically, it assesses areas that are not universally taught. For example, the OLSAT does not assess reading and math abilities. Some educators use the level A test to assess preschoolers, even though three-year-olds and four year olds require only 40 of the 60 test questions. For five-year-olds, all 60 test questions are given. A child’s age is a very important factor when it comes to scoring as OLSAT scores are measured against peers in age groups of 3-month bands. Children born October 1st through January 1st are compared with other children taking the OLSAT within the same age range. OLSAT test prep begins with familiarizing your child with the test-taking process. It is also important to have your child work with OLSAT practice questions that are similar to what they would encounter during the test. Sample questions for each OLSAT level can be found below. Our OLSAT Parent FAQ includes answers to the most common questions we receive from parents. We encourage you to message our Parent Success Team by chatting from the lower left-hand side of the screen or sending an email to help@testingmom.com to find out how we can help your child get their highest possible score on the OLSAT. Between testing and administration, it takes 50-60 minutes for a student to complete the test. It may take a little longer when the teacher reads questions to students at the lower levels. For younger children (like preschoolers, kindergartners, and first graders) the test is often presented in a one-on-one setting while older children typically take the OLSAT in a group setting. The test itself is given in black and white, but many of TestingMom.com’s OLSAT practice questions are shown in color to make the test preparation process more interesting and fun for children. 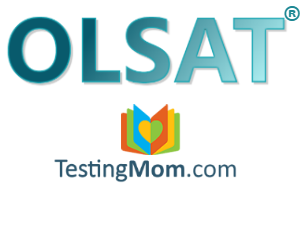 TestingMom.com Pro-tip: Incorrect answers are not penalized on the OLSAT test, so guessing on questions on the OLSAT test will not hurt a student’s score. Guessing incorrectly will yield the same score as leaving the question blank. The OLSAT test is structured so that difficult questions are immediately followed by easier ones and vice-a-versa. This prevents students from being discouraged by tough OLSAT test questions towards the end of test sections. The total score of the OLSAT test is called the School Ability Index (SAI) and is comprised of a verbal and nonverbal score. Verbal Comprehension – Following directions, identifying antonyms, sentence arrangement & completion. Verbal Reasoning – Logical selection, verbal analogies, verbal classification, and inferences. Pictorial Reasoning – Picture classification, picture analogies, and picture series. Figural Reasoning – Figural classification, figural analogies, and figure series. Quantitative Reasoning – Number series, numeric inference, and number matrices. Where is the OLSAT given? The OLSAT is given across the United States with metropolitan areas having the highest concentration of parents looking to prepare their children for the test. It is very commonly used in California’s GATE programs. New York city and many other metropolitan areas in the northeast and southeast United States also administer the OLSAT for gifted program admission. The pictures in the first part of the row are related in a particular way. In the next part of the row, find the one picture that belongs in the empty box. On top, the 2nd picture is a combination of the bottom and middle shapes in the first picture, and the 3rd picture is a combination of the middle and top shapes in the first picture. So on the bottom, the middle and top shapes combined in the same way would be the 1st answer choice. To solve this, think of a rule that describes the relationship between the 3 items on top. Apply that rule to the missing figure on the bottom. Test the rule with each answer choice. If you choose it, will the items on top be related to each other in the same way as the items on the bottom? If more than one choice fits the rule, then look for a more precise and specific rule that describes the relationship between items on top. As figural analogies become harder, tell your child that there will be more than one type of change within a given figure matrix analogy puzzle. 1. These are similar to analogy questions, except that you should think of the reason why the items on top belong together in one group. What is the same about all of them that they belong together as a unit? 2. Test that reasoning (above in #1) with each answer choice – if you choose it, will all 4 items belong together in a group for the reason you identified? 3. If more than 1 item or if no item fits with the items on top for the reason you identified, look at the items on top again and re-think why they belong together in a group. 1. Listen. For Sentence Completion questions, where the teacher will read the question prompt, remind your child to listen carefully- the question cannot be read twice. 2. Look at every answer choice. Consider every answer choice one at a time; then pick the best one. Sometimes, more than one answer will seem right. Other times, no answer seems ideal. Pick the best answer of the possibilities offered. 3. Always guess. If you aren’t sure, eliminate answers that are definitely wrong and then take your best guess. There is no penalty for guessing. 4. Practice filling in bubbles (for children K and above. Pre-K only need to point to answer). Be sure to practice filling in bubbles completely and using the bubble sheet. Clarity is key. My child will be taking the OLSAT for entrance into 9th grade. Will that be OLSAT level F or G? I asked the school, and they said that they do not release that information. is Level E testing for current 4th and 5th student and entering 5th and 6th grade? Yes, OLSAT Level E would be given for entering the following grade. If in 4th grade, it will be given for entering 5th grade program. If in 5th grade, it will be for entering 6th grade. My son is going to grad 4. I would like to buy a book(Question and answer) to prepare him for OLSAT exam. My daughter is going to grad 4. I would like to buy a book(Question and answer) to prepare him for OLSAT exam. Hi Perry! First, I would recommend a membership to TestingMom.com. We offer an extensive collection of practice questions and answers for the OLSAT test for all grades from Pre-K through the 8th! In addition, we have interactive games and questions to use in order to prepare for the OLSAT. If you are still looking for a book after that, we do offer OLSAT workbooks through our TestingMom.com Store. Hi Susan – make sure you are logged into the web site (upper right). After that, select OLSAT test in “My Program” area. That will have the entire collection of practice questions for the OLSAT. If you still have issues, please call us at 877-609-6203. We’re answering our phones until 11pm ET tonight. Is there any other questions besides the 100 practice questions for non-members? For the students to entrance into 9th grade, which level (OLSAT Level F or G) should we take? If your student is currently in 8th grade, then use Level F! If they do okay on practice materials for level F, you can also practice with Level G.
is OLSAT testing the IQ testing for the gifted and talented testing in Austin area. i want to learn this kind of test because im taking the olsat entrance into college level . My child is entering 3rd grade in September 2018, the school administers OLSAT in the summer before (August 2018), would it be appropriate to review Level C or Level D materials? Hi there – It would really be up to the school if your child will receive level c or d. I would recommend working with the practice questions for both level c and d to have your child ready for any of the levels that he or she will receive on the day of her test. My daughter missed taking the Gate test at the end of third grade. I just found out after she enter fifth grade, then I requested the school. So, the school allowed my child to take the OLSAT in April two month before ending fifth grade. My question is, can i request school to let her re-take the gate test after she get into Six grade? If so, which OLSAT level should i buy to let my kid practice? She is going to be in Six grade in this fall 2018. Should i buy only OLSAT or both OLSAT and CogAT? Hi Amy – please email us at help testingmom.com for us to help you out with your questions! How to I obtain the book or can it be downloaded? OLSAT® (Otis-Lennon School Ability Test®, Eighth Edition) is a registered trademark of Pearson Education, Inc or its affiliate(s), or their licensors. TestingMom.com is not affiliated with nor related to Pearson Education, Inc or its affiliates (“Pearson”). Pearson does not sponsor or endorse any TestingMom.com product, nor have TestingMom.com products or services been reviewed, certified, or approved by Pearson. Trademarks referring to specific test providers are used by TestingMom.com for nominative purposes only and such trademarks are solely the property of their respective owners.